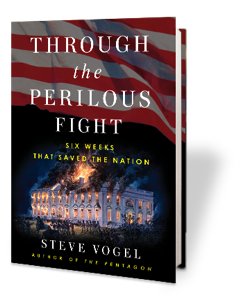 Steve Vogel is the author of the new book Through the Perilous Fight: Six Weeks That Saved the Nation, which focuses on the War of 1812. 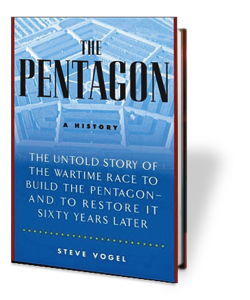 A former reporter at The Washington Post who has covered military issues, he also wrote the book The Pentagon. Q: What inspired you to write Through the Perilous Fight? A: I grew up and have spent much of my life in the Washington area, living at different times in the District, Virginia and Maryland. This cradle of American history is filled with sites and markers making references to the Revolution and the Civil War. I was always struck by the comparatively little attention paid to the War of 1812, despite the remarkable events that took place in the area. 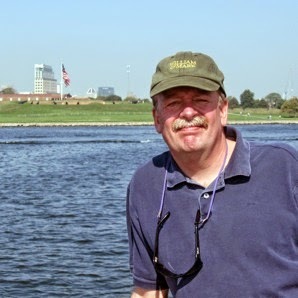 In the late 1980s, some friends and I took a pontoon boat up the heavily silted and badly polluted Anacostia River to Bladensburg, Md., site of the battle that decided the fate of Washington. We found only a forlorn waterfront with a nearby go-go bar, but virtually no reference to the battle. I had always wanted to learn more about the story behind the British invasion, the capture of Washington’s capture, and the story behind the Star Spangled Banner, and decided the bicentennial was the time to do it. Q: Your book is very detailed--what kind of research did you do to recreate this period, and was there anything that particularly surprised you? A: The book involved research on both sides of the Atlantic Ocean. In the United States, this included research at the Library of Congress, the National Archives, and various state and local historical societies, most importantly the Maryland Historical Society. There were a lot of surprises in what I found, but one I should mention was how much fun I had exploring some of key sites in the story by land and water. I traveled by ferry to remote Tangier Island in the middle of the Chesapeake Bay, which the British used as their base to launch the attacks on Washington and Baltimore. I sailed up the Chesapeake Bay from Norfolk to Baltimore aboard the Coast Guard tall ship Eagle, following the British route of invasion. My children accompanied me on many of my research trips, most memorably on an archaeological dig overseen by the Smithsonian at the site of the Battle of Bladensburg, where they helped uncover the floor of a building believed to have been an anchor of American defenses. I traveled to Great Britain in 2010 to search for papers not previously examined by American authors. I examined numerous records and diaries relating to the British expeditionary force, including at the British National Archives in Kew, the British Library, the Royal Marine and Royal Navy museums in Portsmouth and the National Maritime Museum in Greenwich. I also visited Northern Ireland, home of General Robert Ross and other key figures in the campaign, and conducted research at the Public Records Office in Belfast I visited Ross’s home village of Rostrevor, where I connected with local historians to visit sites, met Ross’s descendants and gained more insight into the general’s life. Q: Why do you think there’s been less attention paid to the War of 1812? A: The war was really about the future of the North American continent. It’s interesting to note that the war loomed very large in the American consciousness for many years. It had established both an American sovereignty and a sense of union that hadn’t existed before the war. Some considered it a second War of Independence. It wasn’t known then as the War of 1812, which by the way is not a great name for a war that lasted nearly three years. Of course the war was superseded by the Civil War, and over time, 1812 receded in our collective memory. Q: What accounted for the different outcomes in Washington and Baltimore during the fighting in 1814? A: A lot of things, but one important reason was the three-week delay before the British attacked Baltimore. This gave the city plenty of time to prepare, and allowed for thousands of militia from across Maryland, Virginia and Pennsylvania to join in the defenses. It also shows the difference a few critical people can make in changing history. Having Gen. Samuel Smith in charge of the militia defenses in Baltimore was an enormous improvement over Gen. William Winder in Washington. One thing I don’t give much credence to is the claim that the differing outcomes prove Baltimoreans were tougher than Washingtonians. In fact, most of the militia troops manning the first lines of defense at Bladensburg outside Washington were from Baltimore and Baltimore County, and they were the first to flee in the face of the British advance. A: I’m mulling over some ideas for a new book project, and also spending a lot of time on events in coming months for the bicentennial of the burning of Washington, the battle for Baltimore and the writing of The Star-Spangled Banner. A: The next time you sing the National Anthem at a baseball game or wherever, you have to remember to remember that the verse we sing is really one long question, ultimately wondering not just whether the flag was still flying, but whether the republic would survive. Key wasn’t at all sure at that moment that it would. His description of the American flag flying over Fort McHenry in Baltimore harbor after the tremendous British bombardment created an indelible image for a nation shaken by the fall of Washington, not unlike later images of the flag raised by Marines at Iwo Jima or by firefighters at the World Trade Center after 9/11. --Interview with Deborah Kalb. Steve Vogel will be participating in the Bethesda Literary Festival, which runs from April 11-13, 2014. For a full schedule, please click here.